Autopilot, a form of advanced cruise control, handles some driving tasks and warns those behind the wheel they are always responsible for the vehicle’s safe operation, Tesla has said. The U.S. National Highway Traffic Safety Administration, which issued the statement, and National Transportation Safety Board are investigating a fatal crash in March in which the driver was using Autopilot. Following that fatality, Tesla pointed to a 2017 NHTSA report on a May 2016 fatality involving a driver using Autopilot. The report said crash rates fell by 40 percent after installation of Autopilot’s Autosteer function, and noted that this number was derived from Tesla airbag deployment data. The agency described the Autopilot analysis in the 2017 report as a “cursory comparison” of airbag deployment rates before and after installation of the feature to determine whether models with Autosteer had higher crash rates. Such a finding “could have indicated that further investigation was necessary,” the agency said. In March, Tesla said that over a year ago, the U.S. government found that its first iteration of Autopilot reduced crash rates by as much as 40 percent. “Internal data confirms that recent updates to Autopilot have improved system reliability,” it added. On Jan. 19, 2017, Musk tweeted: “The data show that the Tesla vehicles crash rate dropped by almost 40 percent after Autosteer installation.” Autosteer, a system that automatically keeps the vehicle in the center of a lane, is part of the Autopilot technology package. 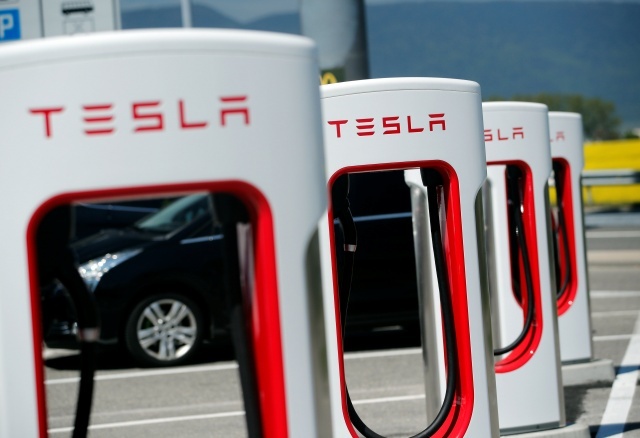 The NTSB confirmed last month it had two other pending investigations of incidents involving Tesla vehicles, including an August 2017 Tesla battery fire in Lake Forest, California, after an owner lost control and ran the vehicle into his garage. Tesla said it had improved the system since the crash. Tesla on Wednesday told investors in its quarterly financial report that on March 15 it released a “significant Autopilot update” that has been well received by its customers.